It was Day 3 on our NYC “not a tour” trip. Day 1 was a movie — Pickup on South Street; day 2 was a concert — Ride; Day 3 was shopping and just hanging about. The one thing about New York City is there’s so much to see and do, that it caters to everyone’s interests, so we ended up focusing on culture, cinema and art. 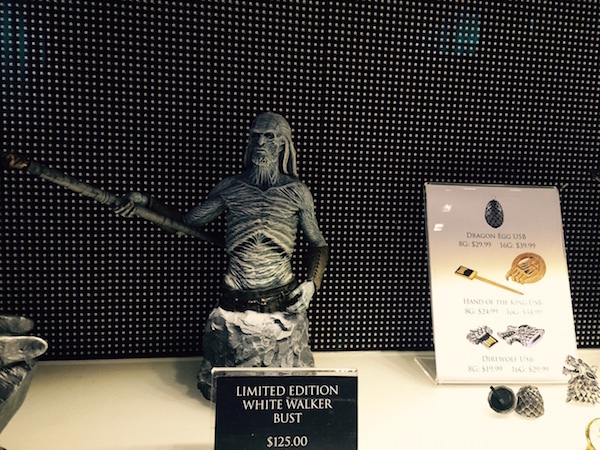 We spent some time at a Game of Thrones store (! 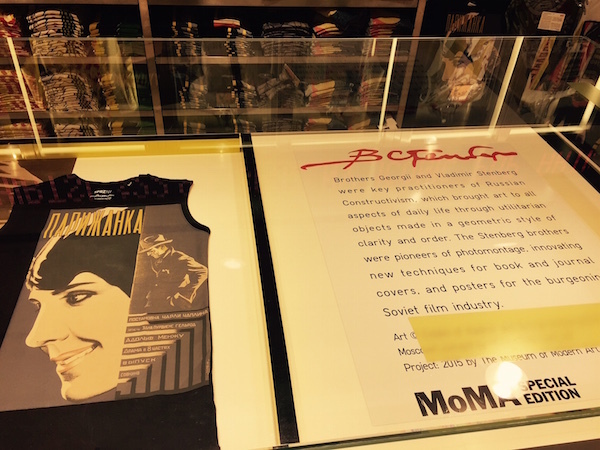 ), near MoMa looking at Russian Constructivist artwork, and ended with me making a beeline to Criterion Collection Headquarters. Since the latter trip is what is most interesting to readers here, I’ll start with that and work my way backwards. This is like the Memento of blog posts. Disclaimer: Please do not try this without contacting Criterion. They are super friendly as I found out, but this is a place of business and they probably don’t want hordes of people dropping by. It was getting toward the end of the day. We had already walked for miles, shopped at the places we wanted to shop, and were a little bit travel weary. We decided to head back to the hotel. My wife wanted to get in a nap before our dinner reservation. We were walking on 5th Avenue, which has a mixture of upscale retail, commercial and tourism. We passed CBS without interest, but that prompted the thought – where in New York City would I like to go that would connect with my film interests? It hit me like a bolt of lightning. 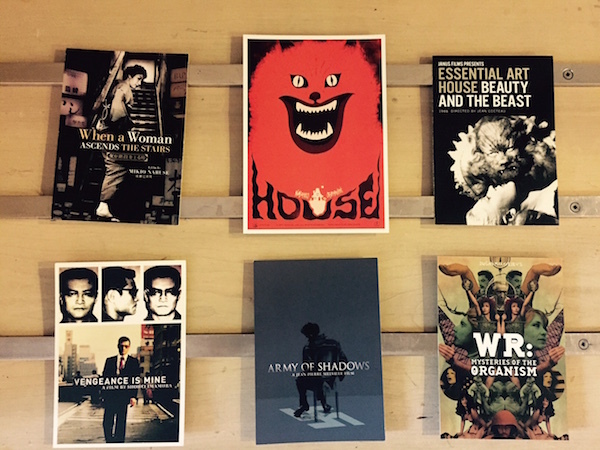 THE CRITERION COLLECTION. As we walked, I became one of the people that annoy me – the phone walker. I was using Maps and the Internet to try to figure out where in the city their office is. As luck would have it, Criterion was not far from our hotel, only it was on the opposite side of a big landmark. There was no way I was going to talk my wife into going with me. I looked at the clock and it was still during the business day on a Friday, but with us leaving town on Sunday, this was the only opportunity. My wife laughed when I told her my plan, but it was to split up at the crossroads. She would head to the right to the hotel, while I would head left and try to find Criterion. It was about a mile of a walk out of our way. The office was hard to find. There is no large sign out that says ‘Criterion Collection.’ I had an address, but it is not really easy to see street numbers. At first I passed it by a couple blocks, still looking for it on the left. The Internet helped again, and I was able to narrow down the building they were in. Eventually I found it, and it was just that, an office building that looks like the thousand other New York buildings. As I walked in, I looked at the directory on the right to see if Criterion was listed. Nope. Was this the right place? I walked in further. There were two security guards at the very front. I work in an office at home, but realized that I was wearing a concert shirt, had gone three days without shaving, and had been walking all over the city in the rain. They were professional, but wanted to know where I was visiting. I cleared my throat. “The Criterion Collection,” I said, probably with a waver in my voice, expecting them to say “The What? ?” Instead they responded with “name and ID please.” They didn’t even do a double take about my appearance. 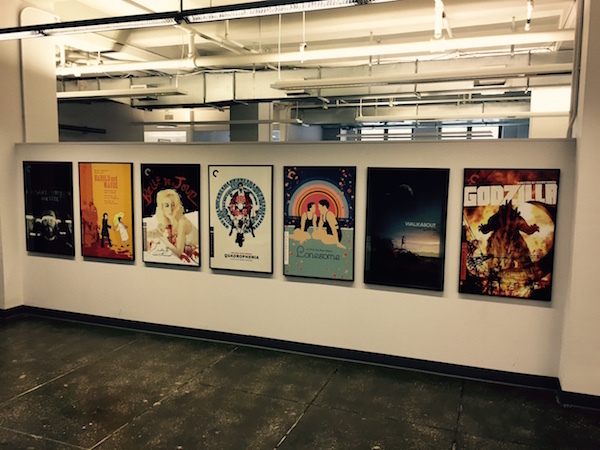 It then dawned on me that I was visiting an office that gets tons of artists. I was probably dressed more appropriately than I thought. Once past the first barrier, I was in the building and had to figure out where the office was. There were about 20 floors. I went into an elevator with a group of businessmen. I guessed at the floor (correctly, I would find), and they all looked at me curiously. I would find out why later. As I got off the elevator, it was there before me. It looked like any ordinary office with a reception area, transparent glass walls and doors. There was no large Criterion sign, but there was a distinctive feature. There were movie posters, all over the place. From the elevator I could only see Belle de Jour, and as I got closer, there were many more. They were all over the place. I had found my Mecca. I walked in and to my right, saw a young gentleman who looked at me curiously. I could tell they were not used to visitors. Again, my nerves shot up and was expecting to be escorted back to the door. Instead I just told them the truth. “Hey there, this may seem weird, but I am just a major fan of your products. I own a ton of them and follow you religiously. I just wanted to swing by, say hello and thanks.” Again, I braced myself, but was relieved when I was not turned away. As I mentioned above, I had seen a concert the night before and was wearing the shirt. 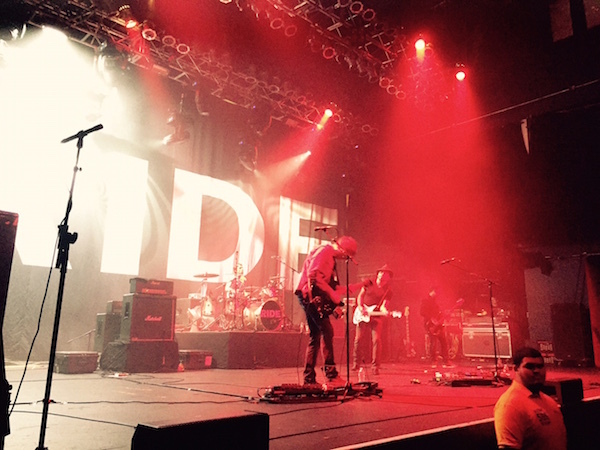 Ride is an obscure art-rock band, technically categorized as “shoegaze”, but not a band that the masses would know. The young man, essentially acting as receptionist, said hello. Seeing my shirt, he asked if I was at the show last night. That broke the ice. Yes, and it was amazing. We talked about that shortly, so it was nice to have common ground. He had not been able to make it to the show, but was clearly a fan. I was looking around and still wary of being thrown out. 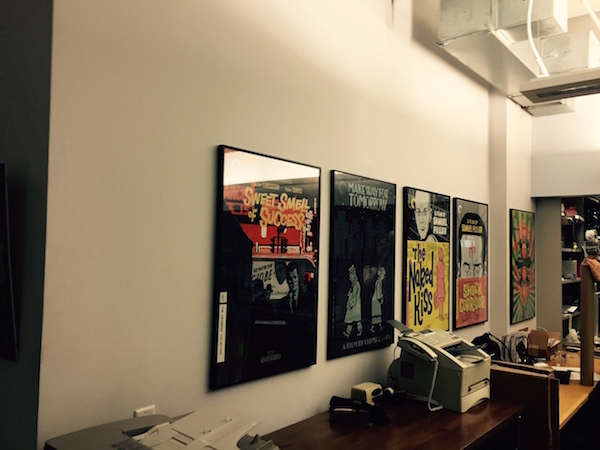 Aside from the posters, this looked like any other office. There was a waiting room with comfortable couches and coffee table books (one of which was Criterion Designs, naturally). There were fax machines, copiers, files, and that sort of thing. There were two people up front, the Ride fan and a still-young, but slightly older lady behind him performing various office functions. As we would talk, she would occasionally look back and beam a smile, usually when I made some sort of film reference. They were welcoming and invited me to take pictures of the posters and reception area. Still nervous, I took pictures, but I did quick takes shots from my phone rather than lining them up perfectly to get everything in the frame. I guess if I had done the latter, I would have been right at home. We started talking. “Are you film buffs, or do you just work here?” was my first question, and it really was a dumb one. “We work here, but we are film buffs, and that’s why we work here.” Great answer! Thousands of people would dream of working at Criterion, and even though I have a terrific job back at home, I’m one of them. We then began to talk shop. He knew the city, the film industry, and could hold his own talking with a film geek. He asked me questions, and I told him about myself and how I appreciate Criterion. Yes, I did mention the blog and how I follow podcasts (like CriterionCast), but did not give a lot of specifics. I didn’t get too nosy asking about their roles or what they do. To stay in their good graces, I didn’t want to make this an interview with question after question. It was a pleasant chat. As I was venturing further in to take pictures, I was cut off at one point. “You can only stay within this general area,” he said, pleasantly and not authoritatively. “Besides, there’s really nothing to see back there, just offices.” Oh, there would be plenty for me to see. I’d want to look at every file, in every office drawer, and especially on every computer monitor. Of course I obeyed. The coolest thing was when he asked if I wanted my picture taken. Yes! 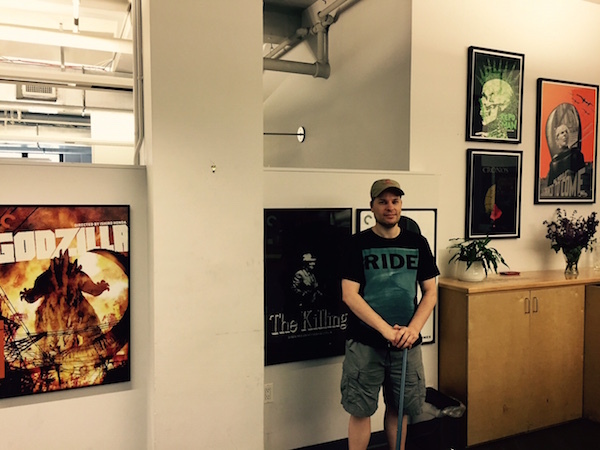 I was looking disheveled, as you can see below, and the cane is for walking in New York after recovering from a surgery. It helps. I asked to have it taken right between the posters for The Killing and Modern Times, because the latter is the one I am working on now. As it turns out I blocked both pictures, but that’s fine. It came out okay. They had a cabinet of postcards and offered to let me take any. I took a select few, and could have taken each and every one. Again, I didn’t want to wear out my welcome. I asked if people like me show up. Occasionally, they said. Not daily, and I got the impression that it may not even be weekly. “But we know we have our fans,” they said. A good 15-minutes had passed and I figured I had distracted them long enough. They were doing their jobs after all, and they were more than hospitable to me. They were great, just the type of people I’d love to grab a drink with and talk films. I had one last request as I left. “Can you pass along to the suggestion people a request?” They smiled. They were glad to, eager to hear what I would come up with. I asked for La Chienne from Jean Renoir. Big smile. “You got it. I will pass that along.” This was another reference that caused the lady to turn around and she again beamed a big smile. They may have reacted accordingly because I recommended a Jean Renoir, who is obviously a favorite of the label, but it is not going to get the sales of a Beatles or David Lynch movie. I also know there is a 4k restoration out there somewhere. Did those smiles mean that it was already in the works, and they were just imagining a positive reaction on the 15th of some month? Your guess is as good as mine, but I am cautiously optimistic. As for the other topics that we discussed, I’m going to remain silent. They did say some things that I could interpret as being a sign of things to come; yet they did not give away any secrets. That said, I left there having gleaned what might have been secrets. These could have been red herrings or perhaps I’m reading into things out of my own enthusiasm. Either way, out of respect to the label and their veil of secrecy (and since they have my name and picture,) I’m going to keep those inferences to myself until they are announced. I’d rather stay in Criterion’s good graces. I will say that if my guesses are correct, there will be some happy people out there. 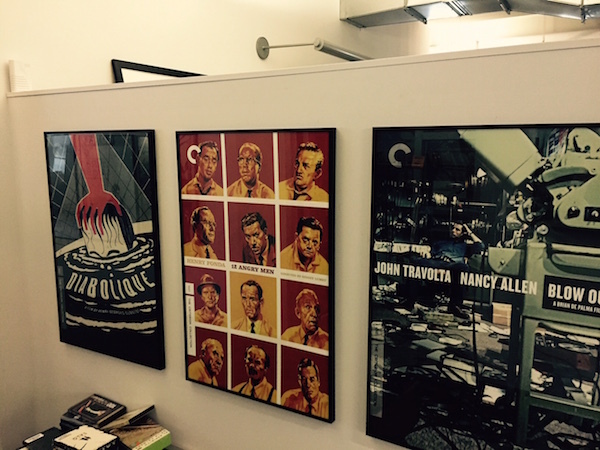 My visit to Criterion was not the only cool film and media place I visited that day. We decided to do some shopping in Midtown. 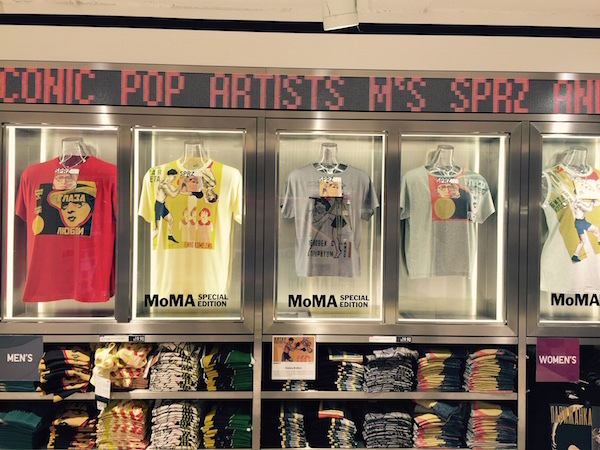 We remember being particularly fond of the Uniqlo near MoMA. We walked along 6th avenue. Along the way my wife spotted the Mad Men bench and took a picture. She’s a fan of the show, while I’ve only seen one episode. Afterwards, we were walking along when my wife spotted a display that stopped her dead in her tracks. “Is that a Game of Thrones store?” I had completely missed it, turned around and there it was. There was a big display in front with the world of Westeros. 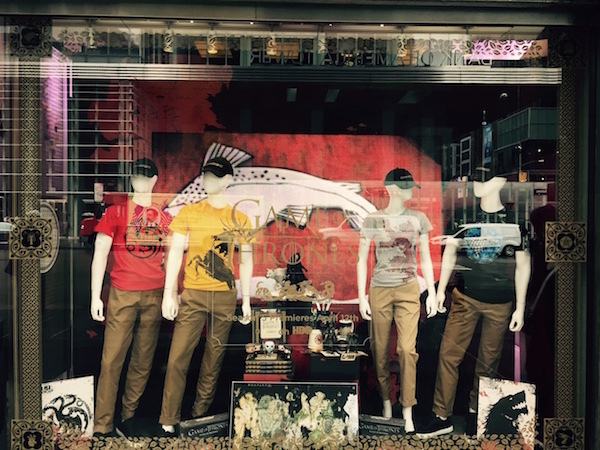 Yes, there is such a thing in the world as a Game of Thrones store. 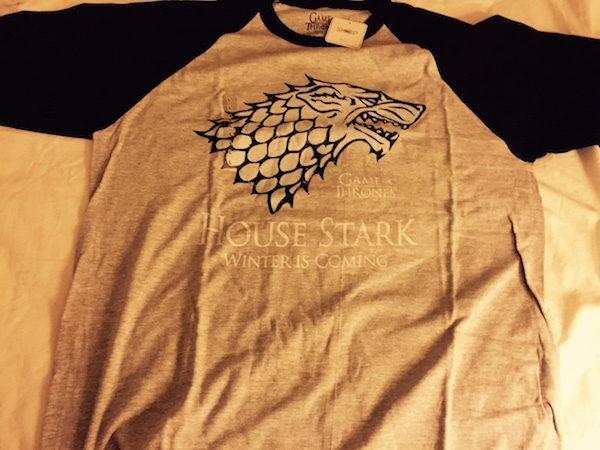 Instead I bought a Team Stark T-shirt. Should I be careful of who I trust from now on? Stenberg Brothers shirts. My wife bought the one on the left. After a lot of browsing, one design caught my attention. It was a “no way!” sort of reaction. I immediately recognized Vertov’s Man With a Movie Camera. An Internet search confirmed that Stenberg did the poster, and it looked exactly like the shirt. I bought that sucker! 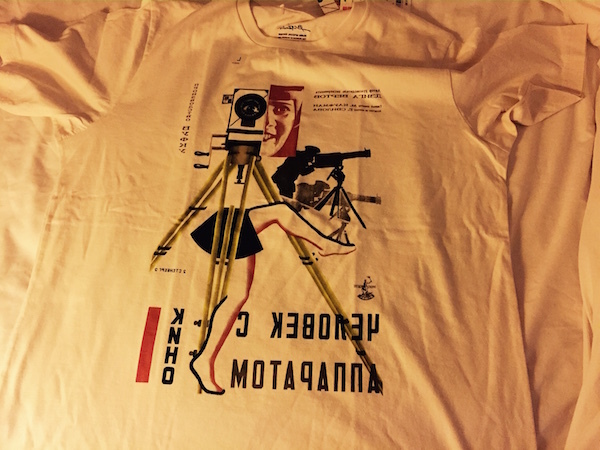 Yes, there’s some irony that I just bought a T-shirt of a propaganda poster for an arguably propaganda film about anti-commercialist values. Vertov might not have been fine with my spending $19 and being able to wear what is basically a conversation starter. I like the shirt. Sorry, Dziga. It is almost a cliché to say that the last concert you’ve seen is “the best you’ve ever seen.” The aforementioned Ride show was really it for me. I’m not going to write a full-fledged review because that’s not the purpose of the blog. 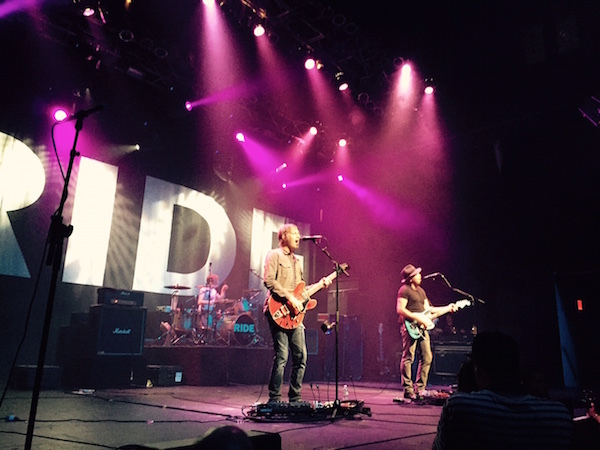 I’ll just say that I discovered them over 20 years ago and have grown to like them a little more with every year of my life. Their music is the ultimate ‘grower,’ and it has become better after years of listening and hundreds, maybe even thousands of plays. Their music is playing in the background as I write a number of these posts, including this one right now. I never get sick of it. They had two brilliant, critically acclaimed albums and a handful of solid EPs. Tensions ran high, and they lost a step. Their third album was not received as well (although I have come to love it over the years), and their last album was a bomb. They had practically broken up during the recording. I hate that last album. A number of years after the break-up, one of the members (Andy Bell) joined Oasis. When they broke up, he joined Liam’s band Beady Eye. The others worked in various projects over the years, but of course, none of them compared to Ride. The split was acrimonious enough that nobody expected them to get back together. Not ever. That changed when Beady Eye broke up, and that’s what prompted this trip. The first (and seemingly only) US date that was announced initially was in NYC. We were lucky enough to get tickets to the sold out show. 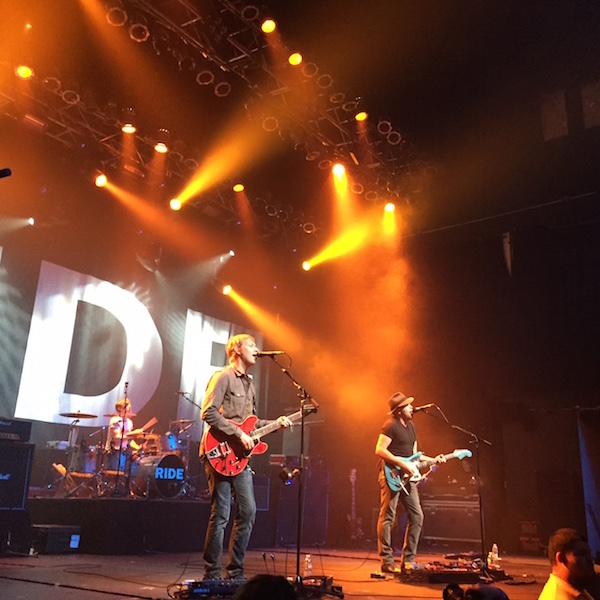 They later announced and have already played other shows in the USA (California, Atlanta), but we were proud to see them in a city that we love. The show was tremendous. They were on for two hours, and played every song I would have hoped for. They’ve come a long way in 20 years and played leagues better than they did when they were kids. The sound (much of it was noise) was pure bliss. They finished with a cover of the Beatles Tomorrow Never Knows, a snippet of which is below, and finished with my favorite song of theirs, Chelsea Girl. My favorite moment was belting out the lyrics to the song right along with them, never expecting to see them play it before my eyes. Posted on June 6, 2015, in Blog, Criterions, Film. Bookmark the permalink. 11 Comments. 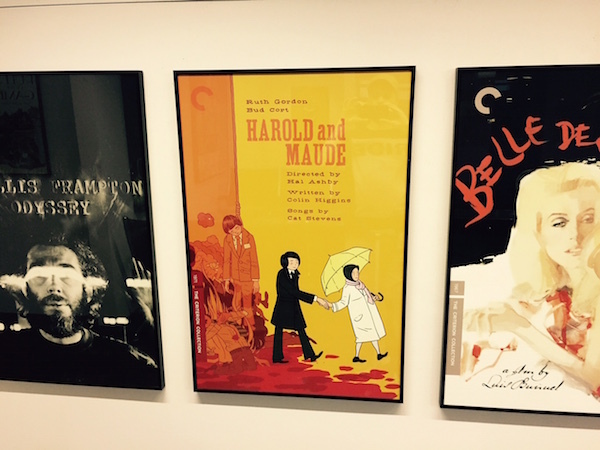 So great, visit to the Criterion office is my idea of tourism! I’m reluctant to call it tourism (and they might frown on that word), but it was my favorite destination. They do have so many fans that I hope one day they’d open some sort of shop to the public. I see your point. Those posters would be a wonderful thing to sell in such a shop! Great report! I am very jealous of all of it (except the GoT stuff). Can’t wait to hear more when we get together next week. You too, Sam! Thanks for being a part of the experience! Even though I specifically asked for LA CHIENNE, I basically said any 1930s Renoir. If I had thought of it, I might have added TONI and THE CRIME OF MONSIEUR LANGE. I’m hopeful all of it will come out eventually. Fantastic account! Sooooooo jealous. Great stuff. Thanks! It was some fun stuff! La chienne will be airing on TCM on October 5th (late Sunday/Monday morning) at 2:30 AM ET/1:30 AM CT. I assume with this airing that we get a release from Criterion later this fall. That is great news. TCM does tend to air a lot of the Criterion releases either before or after they are announced. Hopefully this bodes well for a November announcement.